Vivo has officially confirmed that the new Vivo Apex 2 (2019) smartphone will be launched on January 24. This is the worlds first buttonless and portless smartphone official. The launch event was in China and Vivo talked about the history of Vivo smartphones and there In Display fingerprint sensor and at last finally started talking about the Vivo Apex 2019. So, this is the future of smartphones there are no data interface ports, there are no physical buttons and also is no 3.5mm audio jack. Now the question is how this is even possible? 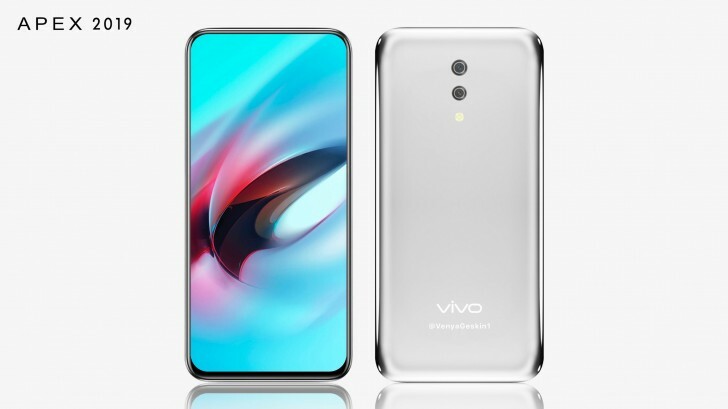 First off this is 2019 and we are talking about Vivo yes this is the same brand who make the world’s fist In Display smartphone official with a pop-up camera and that was the Vivo Nex 2018. Vivo is presenting you the next generation Vivo Apex. Talking about the design we have a full-screen panel and the exciting part is half of the screen is having an in display fingerprint sensor that’s really amazing to see. Now there are no physical buttons how you are going to turn on the smartphone well there’s a sensor hidden on the right side of the panel and it works like a power key as well as volume rocker buttons. There is not USB Port for data interface and charging. However, the back of the Vivo Apex 2019 Smartphone has a magnetic interface which can be used for data transfer and charging. It comes with dual rear cameras an LED Flash and there are no bumps. The specifications are also great and the looks futuristic clean design. This Vivo Apex 2019 is a full display smartphone with no physical button and wents for charging. Vivo Apex 2019 is powered by the Qualcomm Snapdragon 855 chipset. It has a huge 12GB of RAM and 128GB of Internal Storage. There is also liquid cooling which is impressive for glass phones. Final Words: So, this is all about the Vivo Apex 2019 it will be available in white and black color options. This will be the Nex beast from Vivo called the Vivo Apex 2. What are your thoughts on this beautiful design? Let me know your thoughts in the comments down below. How To Unroot Vivo V15? Five Easy Methods!